The classic 1971 May/December rom-com from Director Hal Ashby is in the works for Blu-ray in April. 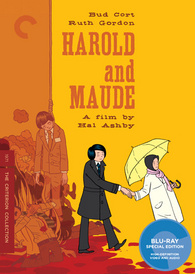 In an early announcement to retailers, the Criterion Collection says 'Harold and Maude' will arrive on Blu-ray on April 17. With the idiosyncratic American fable 'Harold and Maude,' countercultural director Hal Ashby fashioned what would become the cult classic of its era. The Blu-ray will feature a 1080p transfer, uncompressed mono soundtrack (plus a remastered stereo track), and supplements include: Audio commentary by Hal Ashby biographer Nick Dawson and producer Charles B. Mulvehill; Illustrated audio excerpts of seminars by Ashby and writer-producer Colin Higgins; New interview with songwriter Yusuf Islam (formerly Cat Stevens); and a booklet featuring an essay by critic Michael Wood; a 1971 New York Times profile of star Ruth Gordon; and excerpted transcripts of two interviews, one from 1997 with star Bud Cort and director of photography John Alonzo and one from 2001 with executive producer Mildred Lewis. You can find the latest specs for 'Harold and Maude' linked from our Blu-ray Release Schedule, where it's indexed under April 17.